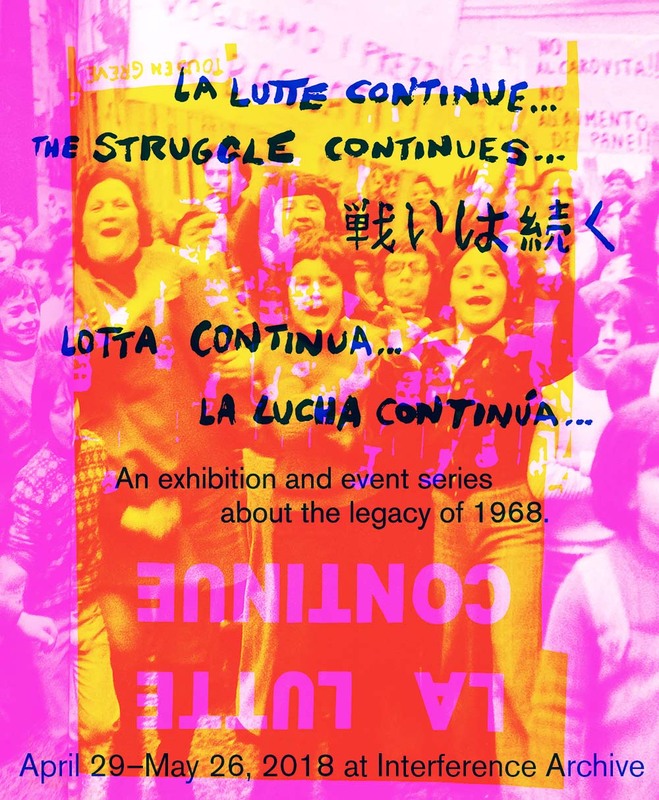 An International exhibition and event series about the 50-year-legacy of the global uprisings in 1968. 1968 was a time of explosive global protest. May ’68 might be synonymous with the general strike in France and the Situationists who inspired it, but mass uprisings and occupations that year reached every corner of the globe, with millions of people rising up to build power in pursuit of liberation on their own terms. From Italy to Mexico, from Japan to the United Kingdom, from the United States to Yugoslavia and well beyond, students and workers demonstrated in mass numbers, held strikes, and occupied their universities and factories. The state’s response to these anti-capitalist, anti-racist, anti-imperialist movements was one of brutal repression. The composition, methods, goals, and achievements of these various movements were far from uniform, but often aligned. They centered on students and workers, rejected the old structures of unions and political parties, embraced intergroup solidarity and collective decision-making, and produced enduring art and propaganda. In studios and on the street, militants utilized time-honored methods of communication, but the generous use of screen printing by Paris’ Atelier Populaire [People’s Workshop] put the technique on the map as a key visual tool of global resistance movements. The events of 1968 represent one of the last major instances of truly global protest. In the immediate aftermath, political structures and social relations transformed, and the uprisings’ successes and failures prompted, informed, and bolstered burgeoning feminist, LBGTQ, anti-colonial, and Black Power movements, setting the stage for the radical 1970s. Key tactics of liberation—and repression—were developed and shared in this period; fifty years on, the traces of 1968 remain visible in the battles still being fought today. 1968 speaks to the power of utopian visions to spur radical action, and to the necessity of reimagining what is possible. Join us for propaganda party in preparation for 2018’s Mayday celebrations and protests. We will be updating 1968 graphics to deploy them for contemporary struggles, with screenprinting, button-making, and more. Organized with Shoestring Press. Stay and check out our great new show, which uses the posters of France’s insurgent 1968 print collectives, the Atelier Populaire, as an entry point into the cultural production of the global 68 moment and its continued influence on politics, art, and design today. Join us for a day-long gathering looking at the impact of the global uprisings of 1968 on our lives and communities in 2018. Student activists and others will be doing a performative reading of On the Poverty of Student Life, a key Situationist text which helped launch the 6-week student and worker revolt in France, May 1968. Screening of Le Fond de l’Air est Rouge [A Grin Without a Cat] (Chris Marker, 1977, 240 min). This sprawling essayistic film is a key document collecting footage from over a dozen countries in from the late 1960s into the early 1970s, and is one of the best windows into the meanings and impacts of 1968. Come join Interference Archive and Common Notions Publishing for themed-drinks and snacks while we watch détourned and Situ-films, including Can Dialectics Break Bricks? (René Viénet, 1973), Society of the Spectacle (Guy Debord, 1973), and more.